An organization account is the optimal way for users within a company, group project, non-profit, or other organization to work seamlessly with each other. Work with complete functionality, create teams and share projects. 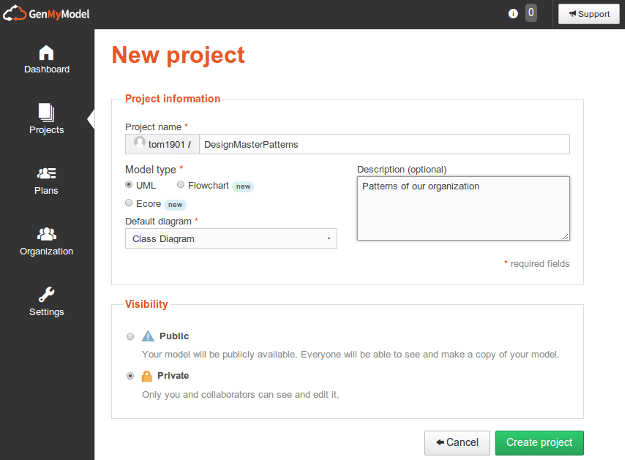 In your GenMyModel dashboard, visit the Pricing Page, upgrade to Team or Enterprise plan and select a team size for purchase. You must provide a name for your organization. Once you've started an organization, visit the Organization page in your account. This page is only editable by the admin of the account. Members can only see other members. 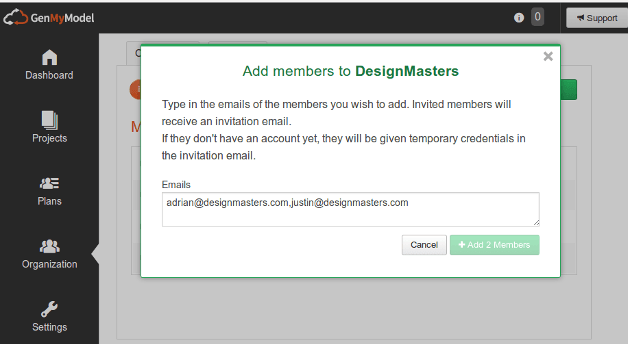 Click 'Add Members’ to enter individual email addresses separated by commas.Invitees will receive an email with a link that directs them to login. 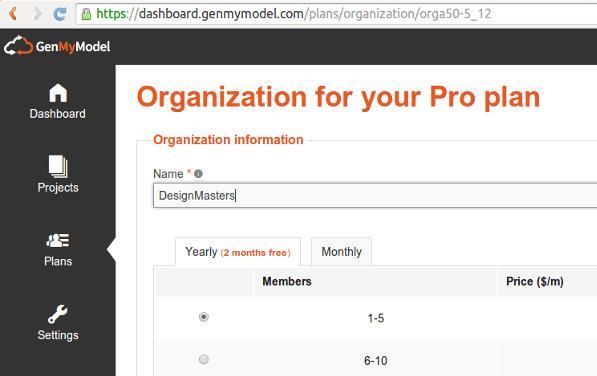 Those having an existing account in GenMyModel can accept or refuse to join the organization. Invitees who don't already have an account automatically get one. The credentials are provided in the invitation email and after logging in, the new user will join the organization. Once your organization is set up, you can create unlimited projects and share them with any members. anyone in the organization can create projects. Only the owner of a project can share with other members. projects created by a member of your organization can only be shared with members of your organization. This guarantees the privacy of your design models. Click on the icon of the desired member. You can select several members. Varying permissions and team/group management will be added soon.